India has a new Prime Minister but is Siddhartha Tagore the product of his genius or of his dangerous mind? India is on edge, as a subversive internal revolt against the Constitution and the threat of Jehadi terror of an unthinkable level, are looming on the horizon. Ringing Shivas damaru in and out of Parliament, a sudden turn of karma catapults outsider Siddhartha Tagore – a conflicted genius, music maestro and prodigal son, with forceful views on China and Pakistan into national prominence as the head of the Opposition Alliance and finally as the newly elected Prime Minister of a disturbed nation. But buried secrets are being resurrected and threaten to expose the past. Twisted within the double helix of menacing politics and hidden lust, Prisoner, Jailor, Prime Minister is a scorching account of Siddhartha Tagore’s fascinating journey from Harvard to 7 Race Course ad. Tabrik C is a political enthusiast, perfumer and internet entrepreneur. He has a post-graduate degree in History from St. Stephen’s College Delhi, where he was the president of the student’s union. His special interest lies in observing, analyzing, predicting and debating the rise and fall of political personalities and their influence on the destiny of nations and individuals. Siddhartha Tagore has multiple shades, broken heart and buried secrets. Ruby/Rubaya is compassionate, adventurous and loving. Karisma is selfless, loving and bold! And people like Gregory/Greg, Rukmani Devi, Thor, Vikram Jaykar, Kabir, Krish Rathore, and Akbar play a vital role. To begin with the cover page is dark with a man treading along a lonely-long road. One look at it, you might wonder, what is it all about. But, you will understand its deep meaning once you complete the book. I appreciate this different approach. The book blurb is very brief and doesn’t give away much. So as you start reading, you will be startled with the story that unravels in front of you. I liked the complexity attached with Siddhartha Tagore’s character. He is weird and kind of eccentric. He is also genius and fights to mend his broken heart. He is intelligent and smart too. 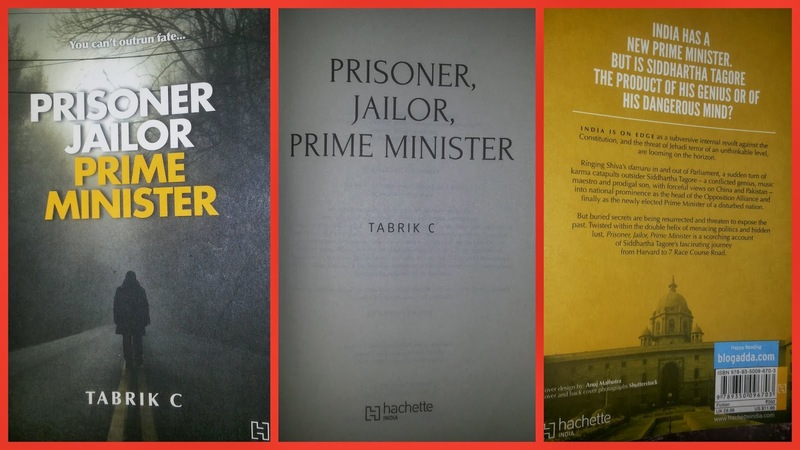 Prisoner Jailor Prime Minister is all about Siddhartha Tagore and his life’s journey. It is almost like a biopic narrating his thirty years of life since teenage. This book is also about people who come into life, those who stays and those who leave. I loved the fact that the author shifts between past and present. I have to admit that past is more interesting and very different. I appreciate the author for taking up such a complex theme and narrate it convincingly. There are a few instances where the author gives subtle hints so that the readers can interpret the consequences. Such an approach agreeably tickles reader’s intelligence. At the same time, it also confuses sometimes. The author has not given much details about Siddhartha’s pre-late-teens days. So less is mentioned about his family. I wish that such details would have helped us understand him better! The book shifts between past and present. Sometimes, it becomes tedious and hinders the flow. And though the book has a little over 300 pages, it is so compelling that we may complete in one-sitting!